“Markttechnik” is one of the most popular trading techniques in Germany. Michael Voigt’s “Das Große Buch der Markttechnik” has become a standard and is the best sold book on technical analysis in Germany. Understanding how the “Markttechnik”-trend (1-2-3) is drawn makes it easier to detect entry signals and to manage one’s positions. The trend is not always clearly visible at first glance. If, however, the movement and correction are drawn correctly, the overall trend becomes easier to identify. This example shows is the 1-day chart for the Dax Future. 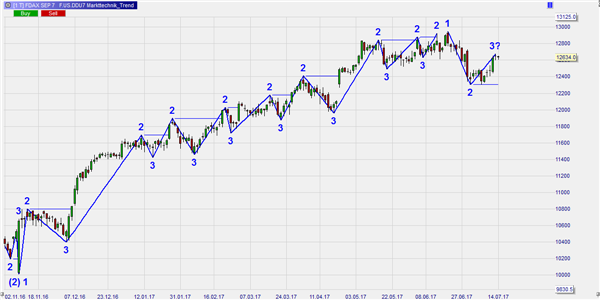 If the trader had entered his position in the direction of the trend in December 2016, the trailing stop, as it is defined by Markttechnik, would not have been triggered until June 2017, when, at point 3, the trend was broken. Many trading platforms make it possible for the trader to draw trends and find entry signals based upon the Markttechnik principle. NanoTrader, in addition, offers the Markttechnik package in the WHS Store. A second way of identifying trading signals is by drawing the trend evolution by means of the zig-zag drawing tool. This tool makes it possible to visualise the buy-, sell-, sideways- and end-of-trend-zones in the chart. The next example shows a bullish trend in a 30-minute chart for the DAX future. For a buy signal to appear after the sideways trend and the correction, the market has to continue the original uptrend and rise above the green buy zone. This, however, is just one main component of Markttechnik trading. The second main component is position management. In Markttechnik trading, three different approaches are available; break-out trading, movement trading and trend trading. The way positions are managed depends on which approach was chosen. Although in break-out trading, Michael Voigt as a rule does not use any stops, the Inside Bar Trailing Stop is used in movement trading and the Zig-Zag-Trendline stop in trend trading. In the next example, a position with three contracts was opened, which will be managed by these three trading approaches. The first limit for the break-out trading was soon reached. The platform next manages the stops for the movement trading and the trend trading respectively. This example shows that the Inside Bar Trailing stop was dragged along on several occasions. This makes it possible for the trader to profit from the uptrend to a maximum. After the Inside Bar Trailing Stop was triggered and, consequently, two thirds of the position filled, the remaining contract will, based upon the latest low and the Zig-Zag-Trendline stop, be taken along for as long as the trend remains intact. Test a free real-time demo including the Markttechnik package.